500ft (Cat.6x2)/(RG6 Quad x2) Combo Cable. Cat6: 24AWG 4 pair soild wire UTP. RG6: 18AWG quad shield. Green color. CMR rated. UL listed. 500ft (Cat.5e x2)/(RG6 Quad x2)/(62.5/125 MultiMode Fiber) Combo Cable. Cat6: 24AWG 4 pair soild wire UTP. RG6: 18AWG quad shield. Green color. CMR rated. ETL listed. 500ft (Cat.6x2)/(RG6 Quad x2) Combo Cable. Cat6: 24AWG 4 pair soild wire UTP. RG6: 18AWG quad shield. Green color. CMR rated. ETL listed. Composite wires / Combo Wires are an easy way to run multiple Audio/Video/Data cables without having to do multiple pulls. Run your multiple audio/video/data cables easily without having multiple pulls. All these cables come in Cat5e/RG6 and Cat5e/16AWG audio combo. At SF Cable, you can have various composite wires or combo wire and at wholesale prices. Our range includes combo cables of 500 ft length. Get lifetime technical support and warranty on combo wires/composite wires. Our wires are RoHS compliant and environment friendly. 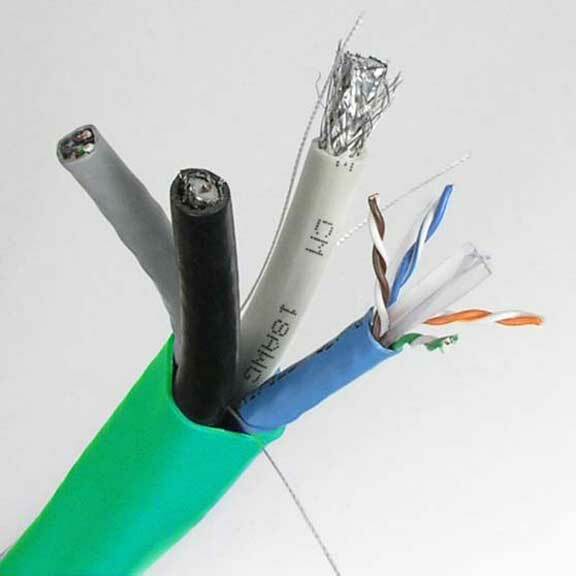 We work with ISO 9001 - 2000 registered manufacturers to provide high quality wires.